Details This original Knebworth pop concert poster came directly from the Estates Manager at Knebworth. 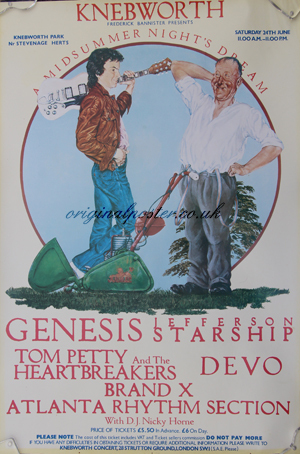 The artwork is a tribute to the preparations involved in staging a rock concert in the grounds of a stately home. By 1978 there had been a few successful summer concerts at the venue and the Estates Manager experienced the thrill of a helicopter ride over the crowd. A full day concert on Saturday 24th June lasted from 11am till 11pm leaving all those who attended with some great memories. This poster is in rolled condition and is the only one we know of.